This week we introduce to you Bro. Rema Duncan, one of the general day session speakers. He is a husband, father and a servant of the Lord. Rema Duncan was born in Brooklyn, NY and received salvation at New Life Tabernacle in South Brooklyn. He ministered across the nation as an evangelist and graduated from Indiana Bible College before a burden for the Chicago metro area came. With much guidance, he relocated to the IL District where he met his bride to be, Fredericka Duncan (a Chicago native). They were married in the fall of 2011. 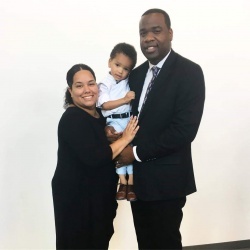 Together, with their son Judah, the Duncan family now pursues the establishment of a strong church congregation in the inner city of Chicago. Rema Duncan has served as Sectional Youth Director in the Illinois District, Regional Coordinator for Project 7 Bible Clubs and Evangelist to the Apostolic Pentecostal movement. RD: The joke my son tells me all the time: How do dinosaurs fly? They just wing-it! RD: While preaching at a rally, my wedding ring flies off a hits a student in the head (lesson: don’t sleep in church=). RD: 1. Set my alarm the night before for 5am 2. Wake up @ 4am. 3. Get irritated for waking up early 4. Try to fall back asleep 5. Can’t fall back asleep. 6. Make a cup of chai 7. Head upstairs for prayer with my bible and my #citiesworthsaving prayer journal. 8. Pray, read or listen to a bible passage 9. Make a journal entry. RD: Dating my wife, playing with Dinosaurs, Vlogging, Gaming. RD: Be consistent in who God wants me to be, be consistent in spending time with my family, be consistent with those I am discipling. Consistency is stability. RD: Received the Holy Ghost and was baptized as a preteen; however, spent a lot of time battling identity, which led to bad decisions. Looking for acceptance in the wrong places. When I made a resolute decision to be “all in” that as when everything I wanted to accomplish in life became a reality and doors of fulfilling my purpose opened. RD: Felt the call at age 12, answered the call at age 20. RD: BE CONSISTENT. Develop a solid foundation of prayer. Work on your “people skills”. Have a healthy balance between your digital footprint and your biblical fingerprint. BONUS: What is the greatest thing that has happened in your life besides salvation?